This week's reading is from the Tapestry Tarot—designed by Yvonne G. Jensen and produced by U.S. Games Systems, Stamford, CT. I love the artwork of this deck: each card deserves an individual study...and time taken to look, reflect and gather. The Devil is associated with Mars—and an unsurprising pull for this particular time, especially considering the astrology. 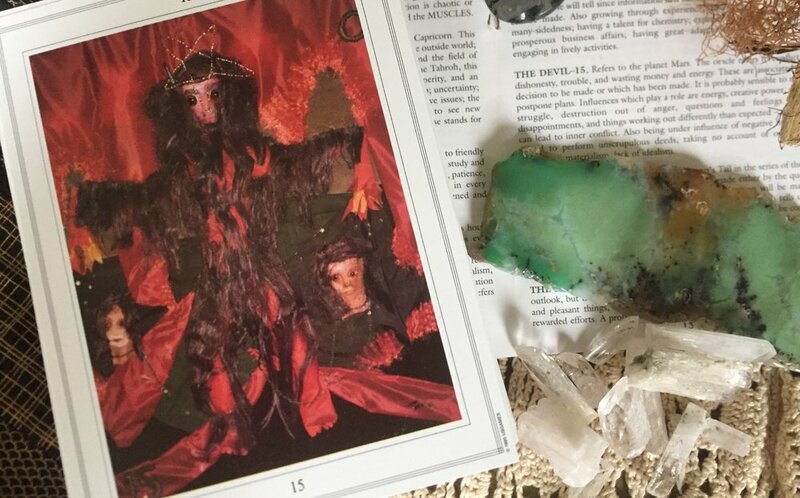 Traditionally, the card might ask you to consider what temptations, addictions and "dark" callings are pulling at your or capturing your spirit, energies and commitments. The card, though freaky, scary and intimidating on first "hear" and glance, is actually one which reminds us ultimate choice...and seeming deception of such. It is a card of opportunity: reminding us, in a sinister sort of way, that addiction is an illusion. In a traditional RWS deck, two people sit below a depiction of the devil "in chains;" but on close view, the chains are not locked, attached or constraining either individual/couple. Here, and considering our astrology, I suggest that the Devil gives us permission to pause this time of struggle, confusion, conflicted energy and relative dis-harmonious shiftiness. This is a time to avoid making important decisions or rash choices. This is a time to sit, watch and wait. The crystals in this photograph are Chrysoprase, Danburite and Labradorite. Today, I have held them close—and have marveled at their energy and the associated feeling of peace, health, wellbeing and clarity that arise.